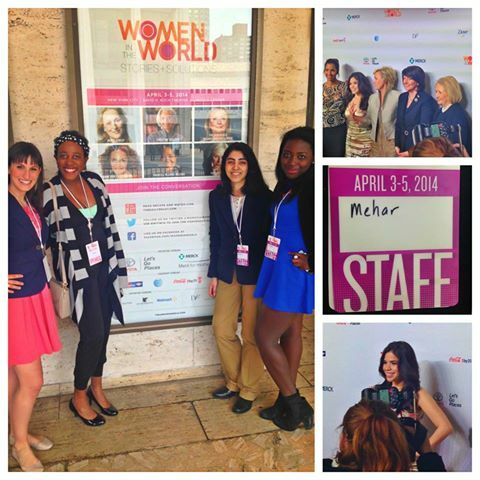 This past weekend, SPARK activists Angela Batuure and Mehar Gujral and SPARK Action Squad Coordinator Crystal Ogar were at the Women in the World Summit in New York City! While Angela and Mehar live blogged from the Women in the World Tumblr, Crystal spoke on a panel called “Mirror Image: The New Way to Self-Esteem.” They heard from speakers like Ruslana Lyzhychko, a Ukrainian pop singer who led the protests in Kiev’s Maidan Square as threats of a Russian invasion mounted, to Hiba Sawan, a Syrian field activist who provided a firsthand account of the chemical attacks and the violence in Syria, in addition to speakers like Hillary Clinton, Christine Lagarde, and Queen Rania of Jordan. Here, Mehar, Angela, and Crystal share their experiences. Mehar: When I saw that Hillary Clinton and Christine Lagarde, two of the most successful women in the world, were going to be on stage together, I was so glad of the opportunity to be at the Women in the World Summit. But after attending, I appreciate the several other voices it elevated–“from war zones to Washington”–even more. It was shocking to learn the extent of the violence going on in Syria and hear the personal stories of Syrian activists Rania Kisar and Hiba Sawan, as well as a young anonymous girl’s war journaldescribing her plight as a Syrian refugee. It was also great to hear from two female senators in the US Senate, Senator Kristen Gillibrand and Senator Susan Collins, on how they are working to end the sexual assault committed on college campuses and in the military. Some other highlights of the summit were listening to SPARK activist Crystal Ogar speak on a panel about self-esteem–it was inspiring to learn about her activism and how she’s overcome the challenges so many girls face–and hear former President Jimmy Carter, still going strong at 89 years old, say that he’ll see the next female President in his lifetime. Lastly, it was of course amazing to hear from Hillary Clinton and Christine Lagarde who offered valuable advice to women in the workplace and discussed how effective and beneficial it is for nations’ to economically empower women. Overall, it was great to have the experience of handling the social media account of an event on such a large scale and truly inspiring to hear the stories of such amazing women fighting against oppression in all walks of life, all around the globe. The quote that will stay with me most is probably by Mamie Streep Gummer, who recited “A Young Girl’s War Journal,” and said in response that “Words matter. Your words matter.” That’s something I hope I always remember and that all girls know. Angela: For me the most inspiring panel, (besides Crystal’s of course!) was “Can Women Fix Washington?” In this panel Senator Kirsten Gillibrand, a Democratic Senator for NYC , and Senator Susan M. Collins, a Republican Senator from Maine, discussed the lack of women’s representation in Congress. Despite their different party beliefs, both women agreed on one thing: if we want to fix Washington, we need to elect more women in Congress. I also liked Senator Collin’s point about striving to get real work done in the Senate rather than working to get more votes. Another panel I really enjoyed was “What Are We Telling Our Daughters?” This panel was especially important because it introduced and important question: maybe it’s not what we are telling our daughter, but what we are not telling our sons–often times, when we discuss the sexualization of girls, we leave boys out of the conversation. Lastly, I really enjoyed the segment with Diane Von Furstenberg. I especially like the quote she ended with: “I never knew what I wanted to do, but I knew what kind of woman I wanted to be.” This strikes a chord with me because as a college freshman, I am at that point in my life where I have to decide what I want to pursue and it’s honestly quite frightening. Instead of focusing on what I want to do I think it’s equally important to focus on who I want to be and how this decision can have a positive and negative influence on other girls around the world. Crystal: Being able to return to Women in the World for a second time was such an amazing experience. The panels were just as inspring as they had been the first time I attended in 2012. One of my favorite moments of the conference was when Cecile Richards, the president of Planned Parenthood, said that “Government works better when everyone is at the table. If you’re not at the table, you’re on the menu.” That really resonated with me and it’ll stick with me for a long time. It’s hard to choose which panel was my favorite, but one of the them was the Inner City Angels, where a woman I met the night before, Sally Hazelgrove, spoke about her boxing club and how she uses boxing, music, and the gang structure to take young men of color off the streets. She also talked about giving them responsibilities, which is so important, because giving youth the ability to show you what they can do is such a great way to give them ownership. I couldn’t not mention my own panel of course, where I was lucky enough to be on stage with Deborah Roberts, a ABC News Correspondent, Tomi-Ann Roberts, Gina Boswell, and Mika Brzezinski. Having the chance to talk about how girls are taking their beauty back through the power of selfies and also discussing my own journey of finding my beauty was something that will stay with me forever. I was also lucky enough to meet some awesome women backstage, but the truly best part was having several women of color come up to me afterwards and share their experiences of not being represented in the media and how that’s made them feel. Also, a group of Harlem school girls stopped me outside of Lincoln Center and were gushing over how much my words meant to them and wanted to take pictures with me, which was wild! One day one of those girls could be on that stage and that’s what matters.